ST-segment elevation myocardial infarction (STEMI). There are approximately 785 000 new events, 470 000 recurrent events, and 195 000 events every year, many of which people are unaware they are in danger. Both spontaneous and percutaneous coronary intervention (PCI)-induced atherosclerotic plaque rupture are capable of initiating the atherothrombotic process. The following platelet response to an injury of a vascular nature is vital and, "is characterised by adhesion of circulating platelets to the vascular endothelium, subsequent activation and aggregation of platelets, and potential obstruction of the intravascular lumen." Acute coronary syndromes (ACS) are the leading cause of death in older adults, aged 65 years or older. It is projected that hospilitisations of ACS will increase from 1.29 million cases in 2012 to 1.43 million cases in 2022 at the rate of 1.04% per year. 40% of the people reported with ACS are US citizens. 58.15% of the cases occur among the male population and in those ages 65 years and older make up 69.01%. 33% of the ACS cases were STEMI, 44% were NSTEMI, and 23% were UA. People 65 years and older who present without chest pain are more likely to die in the hospital compared with ones aged younger than 65 years with chest pain. In fact, older women with chest pain or discomfort are twice as likely to die in the hospital compared with younger women with the same complaint, 13% vs 3.7%. Similarly, older men with chest pain are twice as likely to die in the hospital as men aged younger than 65 years with chest pain, 6.6% vs 2.4%. Older women with ACS who present without chest pain are 6x more likely to die in hospital compared to women less than age 65 years with chest pain, 21.2% vs 3.7%. Furthermore, older men without chest pain are more likely to die in the hospital compared with men aged younger than 65 years with chest pain, 22% vs 2.4%. Vascular injury and thrombus formation are key components in the initiation and progression of atherosclerosis and in pathogenesis of acute coronary syndrome. Atherosclerotic plaque formation occurs as a result of damage to the endothelium of the blood vessel. The damaged endothelium stimulates a cascade of inflammatory events that causes macrophages to digest low-density lipoprotein (LDL) transforming into foam cells and causing formation of fatty streaks in the sub endothelium. Several coronary risk factors can influence this process, including hypercholesteremia, hypertension, diabetes, and smoking. ACS takes place when a disrupted atherosclerotic plaque in a coronary artery stimulates platelet aggregation and thrombus formation. Previous research has suggested that the narrowing of the coronary artery causes a decrease in blood flow and ultimately ischemia, however, recent studies have suggested that the rupture of an unstable atherosclerotic plaque is chiefly responsible for thrombus formation and infarction. 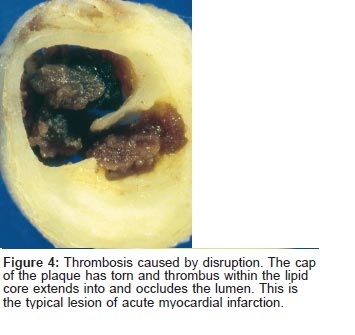 Autopsy studies have shown that plaque rupture causes approximately 75% of fatal myocardial infarction in comparison to superficial endothelial erosions which account for only 25%. In the setting of acute chest pain, the electrocardiogram is the investigation that most reliably distinguishes between various causes. In the absence of such changes, it is not possible to immediately distinguish between unstable angina and NSTEMI. Echocardiography is highly portable, and relatively inexpensive compared with other noninvasive modalities. It on detecting wall motion changes, which occur when myocardial blood flow falls below resting levels. Often this occurs when coronary obstruction exceeds 85–90% of the luminal area. Echocardiography is a class I indication to evaluate RWMA in patients presenting with chest pain but with low-to-intermediate risk. MDCT has the ability to identify plaque area and the degree of stenosis. The sensitivity of MDCT to detect CAD has been reported to be 73–100% with a specificity of 91–97%. CMR has clear roles in the congenital heart disease, chronic CAD, myocardial and pericardial diseases, and imaging of the great vessels. First pass myocardial perfusion utilises a contrast agent co-administered with a vasodilator-like adenosine to delineate under perfused areas highlighting sub-endocardial ischemia. PET is able to identify functional metabolic activity by imaging glucose utilisation. Fluorodeoxyglucose&nbsp;(FDG) once injected is taken up by cells that utilise glucose for metabolism, and the more metabolic activity of the tissue the greater the amount of FDG, taken up. As FDG decays gamma rays are emitted and the position of origin is imaged by PET imaging. Imaging with PET in ACS relies on the ability to detect acute inflammation. Atherosclerotic coronary plaques are characterised by macrophage accumulation. FDG uptake is increased in these areas as macrophages often take up more glucose than the surrounding tissues. Resting and stress myocardial perfusion imaging in patients with low-to-intermediate risk for CAD will identify active inducible ischemia. However, in patients with recent angina symptoms SPECT may not be able to identify recent and old infarcts limiting its specificity. SPECT is more sensitive than exercise treadmill testing alone for detecting coronary artery stenosis. The extent to which a coronary artery is occluded often correlates with presenting symptoms and diagnostic findings. Angina or chest pain is considered the cardinal symptom of ACS. Other symptoms that are commonly associated with ACS include; pain with or without radiation to left arm, neck, back or epigastric area, shortness of breath (SOB), diaphoresis, nausea and light headedness. It is important to note that women often present with atypical symptoms which may ultimately delay diagnosis and treatment. These clinical manifestations include; fatigue, lethargy, indigestion, anxiety and pain radiating down the back. Diagnosis of STEMI requires emergent reperfusion therapy to restore normal blood flow through coronary arteries and limit infarct size. PCI is associated with reduced mortality of approx. 30% and decreased risk of intracranial haemorrhage and stroke which makes it the best choice for elderly and those at risk for bleeding. In optimal circumstances, the usage of PCI is able to achieve restored coronary artery flow in >90% of subjects. Fibrinolytic's restores normal coronary artery flow in 50–60% of subjects. Supplemental oxygen should be given to patients with signs of breathlessness, heart failure, shock, or an arterial oxyhemoglobin saturation <94%. Nitroglycerin has beneficial effects during suspected cases of ACS. It dilates the coronary arteries, peripheral arterial bed, and venous capacitance vessels. The administration of nitroglycerin should be carefully considered in cases when administration would exclude the use of other helpful medications. Patients with ischemic discomfort receive up to 3 doses (0.4 mg) over 3–5 min intervals, until chest discomfort is relieved or low blood pressure limits its use. Nitroglycerin may be administered intravenously, orally, or topically. Clinicians should be cautious in cases of known inferior wall STEMI and suspected right ventricular involvement because patients require adequate right ventricle preload. A right-sided ECG should be performed to rule out right ventricular ischemia. This is common management provided by other healthcare professionals. This generally involves the utilisation of medications, predominately in tablet form. These drugs can be aspirin, adenosine diphosphate ADP)-receptor blockers and glycoprotein IIb/IIIa inhibitors, among others. Aspirin (acetylsalicylic acid [ASA]) blocks the synthesis of TxA2 from arachidonic acid via its inhibition of the cyclooxyrgenase (COX) enzyme. It is the oldest and most studied anti-platelet agent, with early clinical trials in ACS showing consistent benefit over placebo or untreated control for reducing the risk of death and recurrent MI. The joint interaction of ADP with its P2Y1 and P2Y12 receptors not only induces platelet aggregation but also amplifies the platelet response through enhanced secretion of, and response to, platelet agonists such as TxA2 and thrombin. Clopidogrel and other thienopyridines, have become increasingly important in the management of ACS. Ticlopidine was developed as the original ADP P2Y12 receptor antagonist. It is equivalent to aspirin in the prevention of secondary vascular events in patients with ACS. The concept of combining ASA and a thienopyridine for ACS management was first assessed using ticlopidine, with several studies in patients with PCI demonstrating the benefit of dual anti-platelet therapy over ASA alone or ASA plus warfarin. Clopidogrel in recent studies has shown greater benefit in patients as opposed to aspirin therapy. β-Adrenergic receptor blockers have shown to reduce mortality and decrease infarct size with early intravenous usage and can prevent arrhythmias. β-Blockers reduce myocardial workload and oxygen demand by reducing contractility, heart rate, and arterial blood pressure. Anticoagulant medications such as unfractionated heparin (UFH), low-molecular-weight heparin (LMWH), or less commonly bivalirudin have been shown to decrease reinfarction following reperfusion therapy. ↑ 2.0 2.1 2.2 Gillis, N.K., Arslanian-Engoren, C. & Struble, L.M., 2013. Acute Coronary Syndromes in Older Adults: A Review of Literature. Journal of Emergency Nursing, 40(3), pp.270–275. ↑ Research and Markets; EpiCast Report: Acute Coronary Syndrome ACS - Epidemiology Forecast to 2022", 2014, Cardiovascular Week, , pp. 17. ↑ Davies, M.J. et al., 1993. Risk of thrombosis in human atherosclerotic plaques: role of extracellular lipid, macrophage, and smooth muscle cell content. British heart journal, 69, pp.377–381. ↑ 6.0 6.1 Kumar, A. & Cannon, C.P., 2009. Acute Coronary Syndromes: Diagnosis and Management, Part I. Mayo Clinic Proceedings, 84(October), pp.917–938. ↑ 8.0 8.1 8.2 8.3 8.4 Zimmerman, S.K. & Vacek, J.L., 2011. Imaging Techniques in Acute Coronary Syndromes: A Review. ISRN Cardiology, 2011, pp.1–6. ↑ 9.0 9.1 9.2 Overbaugh, B.K.J., 2009. Acute coronary syndrome. Ajn, 109(5), pp.42–52. ↑ 10.0 10.1 10.2 10.3 10.4 Davies, M.J., 2000. The pathophysiology of acute coronary syndromes. Heart (British Cardiac Society), 83, pp.361–366.